William Frederick Rogers was the son of Mr and Mrs Rogers of 65, Swainstone Road, Reading. Both his parents were dead, his father for many years, before the death of William. His mother, Hannah Rogers died 28th February 1912, aged 52. Lieutenant Rogers is buried with his mother in the Reading Cemetery the grave number is 15645. He is remembered as a dear brother. The lettering is very indistinct and currently the grave is not listed among the registered war graves for the cemetery. William Rogers was born at Henley-on-Thames his family moved to Reading when he was about fourteen. William lived in Reading for five years before emigrating to Canada where he became an engineer, later he moved to the USA where he took up motor-cycle riding. 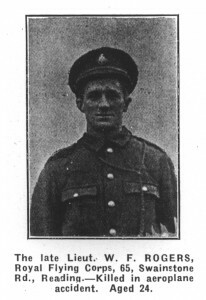 Rogers returned to England in November 1914 and joined a Canadian Regiment in London. Later he was transferred to the Royal Flying Corps, in which he obtained his commission, initially as a Sub-Lieutenant although he very quickly rose to a full Lieutenant when his abilities were realised. He held his pilot’s certificate three to four weeks before he died and was regarded as one of the best pilots in his squad. The body of William Rogers was brought by train from Gosport accompanied by many of his fellow officers. At the railway station the funeral cortège was met by relations and friends. The coffin was covered with a Union Jack and the mourners then walked in procession to the Reading Cemetery. The funeral service was held in the cemetery chapel and as William Rogers was interred the 3/4th Battalion of the Royal Berkshire Regiment provided a firing party. Initial searches of the CWGC website provided no information about W F Rogers however, brief details were found on 5th April 2002. The information gives only his name, rank and date of death and an indication that Lieutenant Rogers is commemorated on the UK Memorial. The author has communicated with the CWGC to have his burial place registered officially. It is known that in due course a war pattern headstone is to be erected. 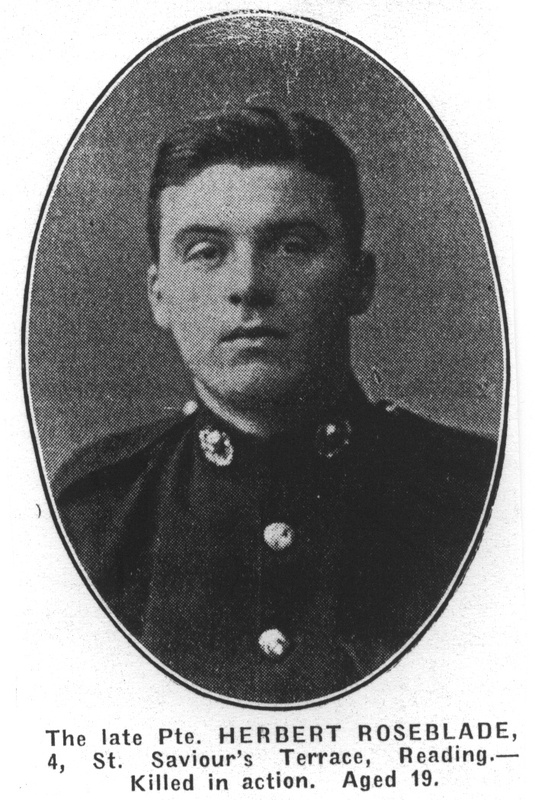 Herbert Roseblade was the son of Emma and Arthur Roseblade, of 4 St. Saviours Terrace, Field Road, Reading. The 1911 census indicates that Arthur was a bricklayer as was older brother John. Herbert worked in a book repair shop. Emma had given birth to six children during her marriage, five survived but only three were living at home. The 1901 census gives the names of William and Albert. Herbert and his brothers all served in the war. 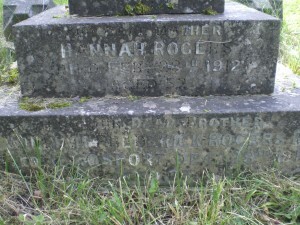 Herbert is commemorated on the headstone of his parents grave. Number 155542. 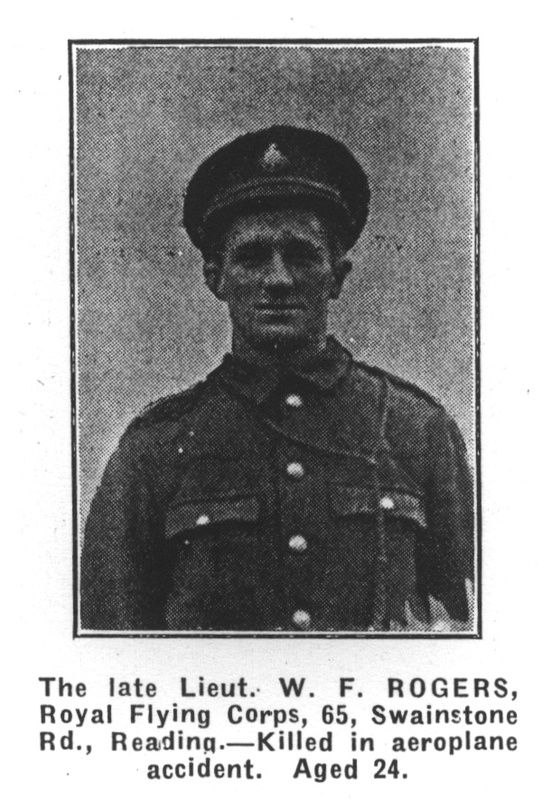 He was killed in action at Gallipoli on 6th May 1915. British forces had landed on the 25th April 1915 and fierce fighting had taken place ever since. The 6th May marked what was referred to as the 2nd Battle of Krithia. Herbert was killed in action in the Dardanelles but his body was lost, he was aged 19. Herbert is commemorated on the Helles Memorial Panel 2 -7. 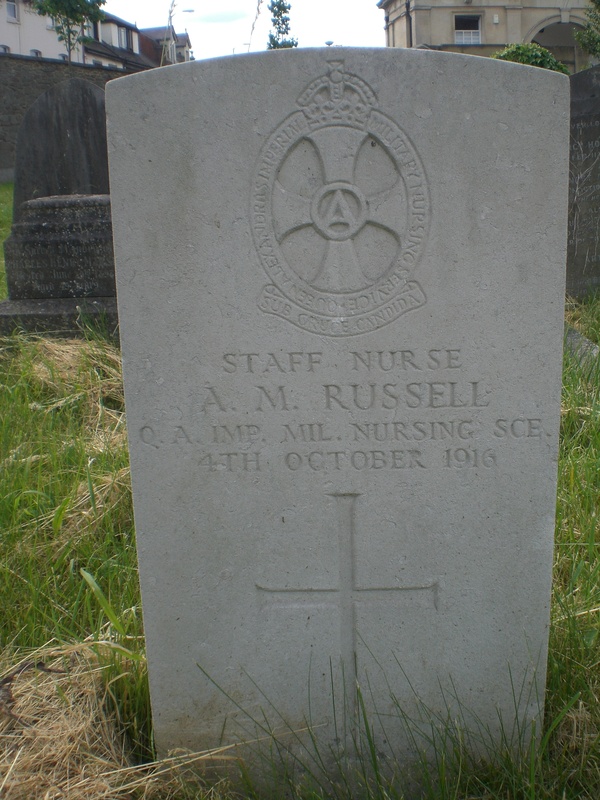 Military honours were accorded at the funeral of Sister Agnes Maude Russell, who died 4th October 1916, at Queen Alexandra’s Hospital for Sick Sisters. Sister Russell, aged 42, was nursing soldiers in Malta when she was invalided home on the 27th September. The soldiers would probably have been those requiring treatment as a result of action in the Dardanelles. Formerly she had been a school nurse employed by the London Education Committee. She was also a Sunday School teacher at Westminster Chapel, where the first part of the funeral service was conducted. Before the interment a service was held at Kings Rd. Baptist Church, the Rev. R. G. Fairbairn officiating. The hymn “For all the saints”, was sung. The mourners were Mr. Augustine Russell (father), Mr. E.A. Russell (brother), her sister, brother and sister in law and cousin. The congregation included members of Westminster Chapel, Matron Q.A. Hospital, members of staff London Education Committee, Matron of No. 1 War Hospital, Numerous floral tributes including from her father, the Girl Guides of Westminster chapel, members of staff London Education Committee, Nurses and staff No. 1 War hospital, the School Nurses League. Her grave has a CWGC headstone.